A rear view of a tethered cow with upright horns standing in a kraal at Yakwach on the Sobat River, which Evans-Pritchard revisited in 1935. Evans-Pritchard notes that this visit to the village was in the rainy season and that away from the raised mound to the rear of the village the swamps virtually isolated the site. 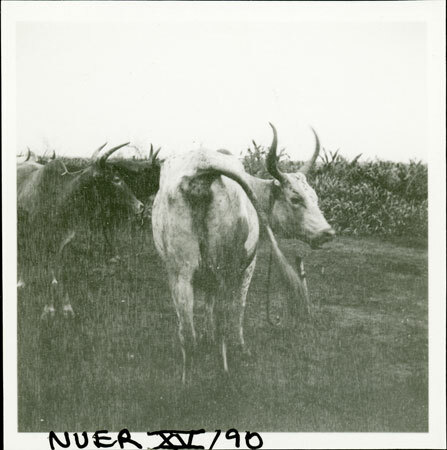 In contrast to his two earlier fieldwork visits when photographing cattle was viewed suspiciously by the Nuer, Evans-Pritchard took numerous record images of them during his later field trips. Note on print reverse ms pencil - "43 2 A82" & print front border ms ink - "NUER XV/90"
Morton, Chris. "Nuer cow" Southern Sudan Project (in development). 03 Jan. 2006. Pitt Rivers Museum. <http://southernsudan.prm.ox.ac.uk/details/1998.355.745.2/>.